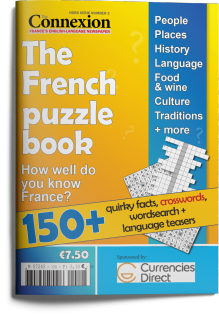 The Connexion’s 96 page French facts and France related puzzlebook will teach you all about France and comes in a handy A5 size. We have arranged the book into themed chapters, each with its own quizzes, puzzles and brain teasers. You can find the answers, often with some extra information, at the back of the book. Test your knowledge on diverse topics, from food and drink to films and literature, from sport and inventions to geography and history. And to test your regional knowledge, spot the pictures from France’s 13 new regions dotted throughout the book. Ideal as a present for France loving friends or for yourself to pass some time relaxing over the summer holidays. If you select the download option it will be available immediately at the bottom of your My Account space (you access this top right of the website when logged in).